In the Brighton Marathon on Sunday, the second of the big spring marathons in the UK, Greg Davis (3:23:39), Troi Baxter (3:49:18), Marc Drury (3:56:10) and Jonathan Ollington (4:19:14) all did the club proud in a huge field of 16,651 runners. Greg was 653rd overall and an impressive 14th of 496 in his MV55 age group in his first marathon since 2015. Troi had a great run with negative splits of 1:55/1:54, finishing 249th of 6,061 female runners, while Marc also boasted negative splits (1:59/1:57), finishing 321st of 1,602 in MV45. Jonathan was 297th of 1,060 in MV50, following on from his 4:10:49 in the Berlin Marathon last September. Also on Sunday, there was an enormous field of 48,031 in the Schneider Electric Paris Marathon. New Jogger Phil Blundell (4:25:58) and longstanding member Adrian Whittle (4:52:06) both represented Newmarket Joggers well in a relatively young, high standard field, with less than usual in the way of fun runners for a popular marathon. Rob Wise (5:42:23) ran in the Boston Marathon in the USA on Patriot’s Day, Monday 15th April. Boston is one of the 6 World Marathon Majors, along with New York City, Chicago, London, Berlin and Tokyo and attracts 35-40,000 runners a year. 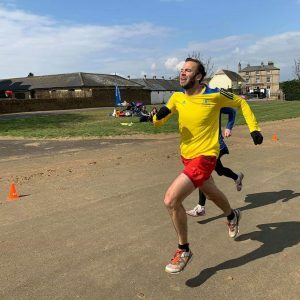 Rob specialises in longer races and clocked 4:39:08 in the Liverpool Rock ‘n’ Roll Marathon last year, so may have been enjoying a more relaxed run at Boston or possibly found conditions a lot tougher. Nearer to base, Neville Clarke (43:38), Brian Munns (48:00) and Jim Withers (57:02) all put in good efforts at the Little Bromley 10K in Essex on Sunday. Neville impressed by finishing 3rd of 17 in his M65 age group, while Brian is at last finding his form after a battle with injuries. Meanwhile, over at Bungay on the Norfolk/Suffolk border it was the 37th year of the Bungay Black Dog Marathon Festival, with races over 10K, half marathon and full marathon. Clive Purbrook (48:22) achieved his best 10K time this year and finished 3rd of 14 in his M60 age group, while in the hilly Half Marathon, Chris Aylmer clocked 2:02:58, identical to his time last year. Interestingly, in the Bungay Marathon, ex-Jogger Daisy Glover (2:46:32) came home 2nd of 133 runners overall and first female home by over 44 minutes, beating the previous female course record which had stood since 2011. This was only her second marathon, having clocked 2:52:17 in Paris last year. She now represents Framlingham Flyers and we wish her continuing success. It was the 1st anniversary of the Newmarket GRL (Great Run Local) on Sunday and there was a big turnout of 62 participants, including 16 Newmarket Joggers in the 5K event, plus 21 participants in the 2.5K event. On this occasion Henry Hamilton put in a tremendous effort to come home first overall (see photo) in a time of 20:37 but doesn’t yet appear to have a timing chip, so his name doesn’t appear in the results. Richard Jones was next Jogger home in 22:09, with first female Elke Hausler close behind in 22:54. Quite a few Newmarket Joggers have helped to marshal and organise this event for the past year and it has come a long way since the first run, thanks to all the volunteers, without whom this event could not take place. Both the 5K and 2.5K begin with a stiff climb up Warren Hill followed by a flat plateau middle section and an exhilarating downhill to the finish, making it a true test of running skill. The GRL is every Sunday at 11:15am. Adults and children are welcome to run in either the 2.5K or 5K event. For detailed Joggers’ GRL results, please see the parkrun & GRL page. Henry Hamilton first home in the 1st Anniversary GRL. Thanks to Henry and the photographer Giles Macrow for this fantastic photo! *Apologies that NJ Marc Drury was missed from the news report last week. He competed in the Larking Gowen City of Norwich Half Marathon on 7th April, finishing in a time of 1:36:52 and did well to come 24th of 144 in his M45 age group. His best time this year remains 1:35:04, set in the Cambridge Half Marathon in March.